We took apart the next iPhone. There are a number of interesting facts gained from the dissection, the most important of which is more concrete confirmation (as if we needed any more) that this phone is from Apple. There are three separate places, inside the case, where APPLE is written prominently. Upon unscrewing the bottom two screws—just like with the 3GS—you can use a suction cup and pry off the back portion of the phone, not the front like on iFixit's 3GS teardown. Once open, you'll notice that the battery takes up around 50% of the phone, give or take. Very impressive. Diving deeper becomes much trickier. There are a total of around 40-50 screws inside the phone, positioned at various angles that are almost frustratingly impossible to get to. Components can be removed and detached from other components. There are a handful of pieces like this. But you don't know which ones are meant to detach, because you don't have the manual. Once you get all the screws off and pry off the pieces that connect the micro-SIM, the camera, the on/off switch and volume buttons, you're ready to access the brains. The main logic board is one very weird piece of this puzzle. 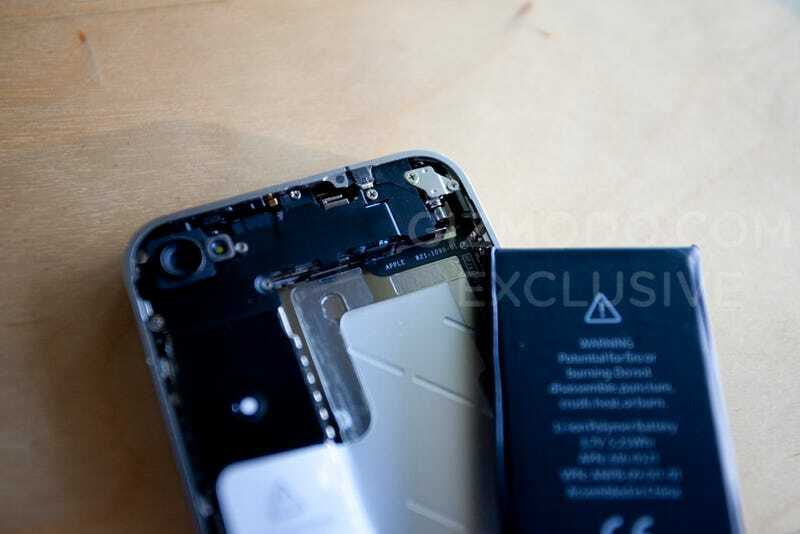 Unlike the iPhone 3GS teardown, which revealed a large logic board along with another part down by the dock connector, this design only has something maybe 1/3 of the size, along with one or two extraneous parts. Basically, the guts have shrunk drastically. Unfortunately for us, Apple intends to keep this a secret. There are no markings on the board, but even so, the board was encased in metal all around so nothing could get through and would be very difficult to remove without breaking the device. Anyone trying to take this part off the phone would damage the device irreparably. On top of this metal, there was a thermal paste-like material. And on top of that, black tape. They really didn't want people looking inside. I wanted to make sure I didn't damage the components beyond repair, so I didn't take the metal off. So this is as much as I could learn without actually breaking the phone. And this is why I couldn't find out if there was an A4 processor—like the iPad's—in this iPhone. I also couldn't really identify many parts, because they were hidden under the metal sheath. Once the guts are out, all you have left is the screen. The back of the screen (on the inside) is a shiny mirror, and if you're not careful when taking it apart, you can scratch the face of the phone from the back, like a CD. If it wasn't obvious by the micro-SIM card, this particular phone most likely wasn't for Verizon. That's not to say that there isn't a Verizon phone in the works, but I'm pretty sure what I held in my hand was not it. No, the battery is not user-removable. You have to open the case to get at it. Two lessons can be learned from the hours and hours it took to disassemble the phone. First is that everything fits in here like an intricately-designed jigsaw puzzle. This is definitely laid out like a final product. To think that there's more room left for any components for this case is unreasonable. Unless Apple decides now to go with a larger case so they can fit more things in there, this is the most that we're going to see this summer. Apple put all these components in here to test, to make sure that they're available for use if necessary. It's also possible that Apple will take out components at the last minute, be it due to a contract issue, or a manufacturing problem, or a cost comparison. Second, Apple really, really shrunk down their parts to make this phone thinner. It might weigh 3 grams more than the 3GS, but remember, the battery is 19% larger than before. Everything else is way reduced to fit the smaller case. After subsequently putting the phone back together, I really feel sorry for the factory workers in China who do this all day.